After the tease from the previous upload, I thought it is only proper to show the real stuff (Malayan Tiger). A very sharp portrait of this tiger. A very interesting capture of this feline swimming, enjoying the coolness of the water. Perfect lighting and accurate sharpness with great details in the face features. Very curious beast, maybe attracted to you :o). Inspires peace and tranquility, perhaps because well-fed. Good focus, good pose good reflection. It is a photo and he looks realy great...just in your photo. I knew this was going to come ,so he is the one from the reflection , ha ha , you are such a teaser man , oh you're going to win my heart with this big fellow , he is just so lovable, well i know how cute he looks here but explicitly he has this 'don't get too near me' kind of look ! A beauitful shot of this tiger while enjoying the swim shot with superb sharpness and details and the lighting is beauitful too. A stunning image of this majestic animal.Perfect exposure with the light reflecting of its whiskers and colouration and design well brought across.The eye contact is a bonus, well done. Fantastic portrait of this tiger swimming. Perfect focus and fine details. Great management of the light, with splendid reflections in the water. 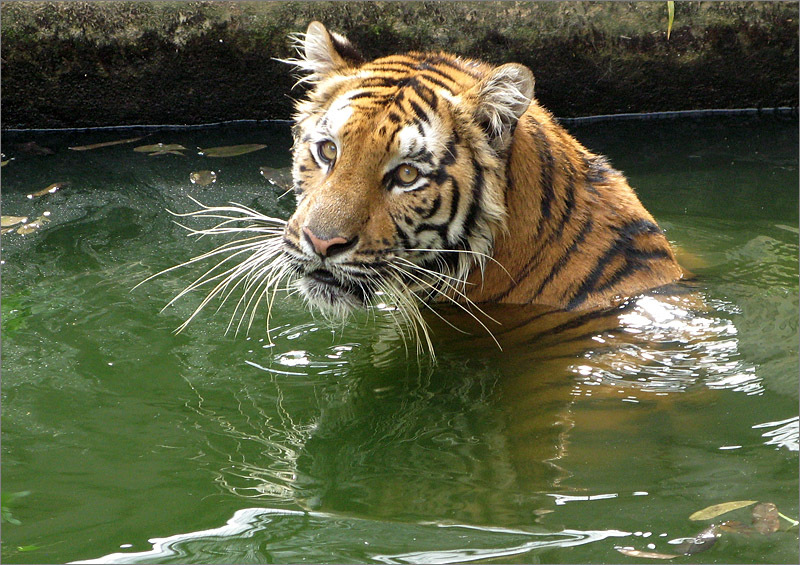 Telle une star sortant de son bain, cette jolie tigresse au regard interrogatif nous offre un excellent clich� au superbe reflet!! !